Looking at Kathy Eneguess’s resume, it’s hardly a surprise she ended up living back among the mountains in New Hampshire’s North Country. Growing up, the Peterborough native spent the summers of her childhood at her family’s summer home on Lake Umbagog; in college, she ran a canoe and kayak school to help put herself through Plymouth State University, where she got an undergraduate degree in physical education; and after she got her master’s, she ran a private high school for ski racers that dropped in at some of the biggest mountains in the world. 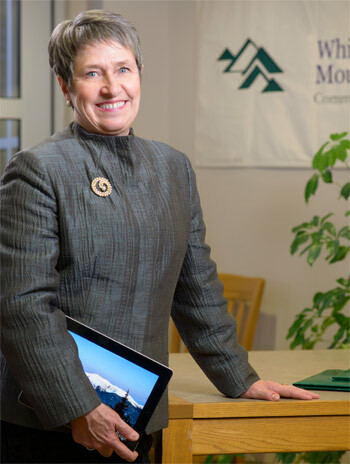 With her combined love of education and the outdoors, it’s only fitting that she’s moved back to the Great North Woods for her current role as president of White Mountains Community College in Berlin. “I have a strong sense of place, and I knew that there was a major opportunity for this institution in the North Country,” said Eneguess, who became president of the college in 2003 after working for 18 years as vice president at the Business and Industry Association of New Hampshire. Under Kathy’s guidance, the college has started many programs designed specifically to help students and local people succeed. These include spearheading a plan to build a 30,000-square-foot transportation center to connect students with jobs in the area’s automotive industry, and designing a hospitality certificate program to prepare students to work in the region’s tourism industry. It also launched a program called Business Services North with two other organizations, which provides information and technical assistance to people looking to open a business. The college is a national leader in virtual business incubation, and was one of 11 colleges nationwide selected to participate in a virtual incubator network. Through that, the college’s incubation services are held up nationally as an example of best practices for small, rural colleges. She also spearheaded a program that works directly with early learning educators at all the child-care facilities in the region to ensure that North Country children are getting the best start in life. In the same vein, Kathy developed a partnership with the University System that allows education students to complete their associate’s degree at White Mountains Community College, then get their bachelor’s degree at the school without having to leave the North Country. Faculty members from Granite State College and Plymouth State University travel to Berlin so the students don’t have to commute 100 miles and can work in local schools. Personally, Kathy is a lifelong Girl Scout who serves on a number of North Country regional development initiatives, and sits on too many boards to name. Notably, she is chair of the New Hampshire Women in Higher Education Leadership network, which promotes women’s leadership within higher education. James Tibbetts of First Colebrook Bank wrote that Kathy has been “very instrumental in creating a really valuable asset here in Northern New Hampshire” by adapting the college curriculum to suit the needs of the business community. A. Out of college I ran a high school for ski racers — we skied internationally for about five years. Then Walter Peterson asked me to come to Franklin Pierce College when he was president there, I ended up in admissions and teaching part time. I’d kept my finger as a faculty member since I graduated from college. Then Bonnie Newman asked me to join her when she was the head of the BIA. That helped me meld my interest in public life and community services and I stayed there for many years. I learned a lot about people and the state of New Hampshire and how it works, and had opportunities to serve and work with many people on many boards, whether not-for-profit and for-profit boards. Then I came to the Community College System — there was a need for an individual both in Laconia and Berlin, and so I accepted the opportunity and here I still am. A. I think the biggest challenge really just comes down to the barriers that I put up for myself of what I could do and what I couldn’t do, and figuring out how I could get where I wanted to move — who were the right people to speak with, which rooms did I need to be sitting in, where was a decision being made? A. I’ve had many mentors. I’ve got a strong group of professional friends as well as colleagues and I utilize them for advice, and often for counsel. I had two very strong role models growing up in my mother and grandmother in community service and making sure you stay connected with others. A. I have a pretty strong set of family and friends to keep me pretty well grounded, but most of the time, I don’t particularly perceive what I do as work-work — it really melds my interests and passions. I really just enjoy what I do. A. Smile and laugh every day. I do ask people to set their goals pretty high. I think it’s very important that you’re setting your goals high, but that you’re also investing in those around you and helping them see opportunities.